1. In a medium-sized bowl, combine the breadcrumbs, Parmesan, parsley, oregano, garlic, lemon zest and melted butter. Mix to create crumbs. 2. 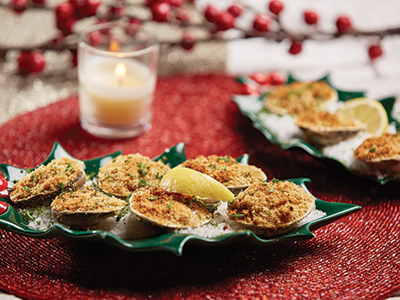 Place a heaping tbsp of the crumb mixture onto the exposed clams. Fill the Copper Chef cake insert with a cup of coarse sea salt. Nestle the clams in the salt and cook at 400 for 3 minutes. Garnish with fresh parsley and lemon wedges.